When I was a doctoral student, I heard someone’s supervisor say that they were deliberately tough with their students because that’s how it’d been for them when they were a postgrad themselves. 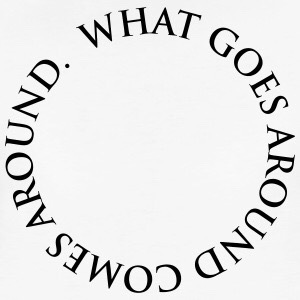 It’s the idea of what goes around, comes around — but in a very negative way. Do unto others as has been done to you, rather than as you’d like to be done to you! By contrast in the yoga world (where karma is clearly a more potent force than in academia!) things are much more compassionate and considerate. I’ve had some amazing support offered to me during the course of this year by several different specialists, helping me with diverse areas of my yoga practice. I’m getting more confident in seeking people out whose work interests me and I’m getting better at asking for help from those with particular skills. I’m quite overwhelmed by their wisdom and capacity for holding someone else’s ‘stuff’ compassionately and helpfully but without judging or trying to impose a quick solution. They’ve helped me (re)view the issues from a slight distance, trusting in me to figure it out in time and with their lightly guiding hand. Hubby tells me I’m easily in awe of my teachers, but I think this is some yoga magic in action from them. But from me also, I must acknowledge. I try to listen truly to what they are saying, even when it’s not what I expect or think I want. And that’s not easy at all! And in turn I like to think I absorb something of their attitude of care and attention to me, and I somehow find that in my own teaching I’m better able to serve my students and to offer my own modest wisdom. A chain reaction of positive energy. This week my only teaching was an individual student I see for a regular private. She is a complete beginner and I feel it quite a big responsibility in shaping her experiences of yoga. But it’s so amazing seeing her find her way, find her shapes, and wake up bits of her body that aren’t used to being explored, and hearing the physical relief she finds in everyday life from this. And because we work one on one, I sometimes get some verbal feedback as we go along, especially if I take her by surprise. During this week’s session I gave a light assist, not to correct alignment as such, but because I saw a place that looked a little tense and she (gratifyingly I’ll admit 🙂 ) gasped in surprise at the different feeling from such a small adjustment and marvelled that by moving her elbow I’d reduced discomfort she was feeling in her shoulder. To her this too is yoga magic, I suppose. Actually, it seems that way to me too: to begin to read bodies, to be able to offer some physical ease (even if trivial), to care enough to attend to the details. I know I have a long, long way to go to be an adequate teacher, but I hope I’m making progress, one experience at a time, one detail at at time. It’ll add up eventually. I just hope I never stop caring enough about the details. That’s the inspiration I draw from those who offer this in various ways to me. Working one-on-one can be very gratifying – both ways – !